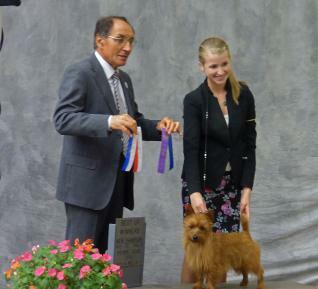 Dunham Lake Australian Terriers... are our friends and champions, Multiple Best in Show, Multiple Reserve Best in Show (holds the record for our breed), BOB at Westminster, Group Placing, National Award Winning Australian Terriers, World Show Awarded Excellent, but mostly...just our loved family members. 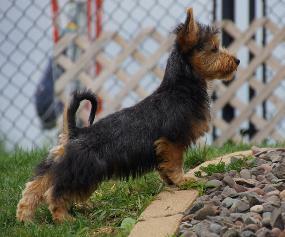 These are dogs that we have bred and co-own with others. 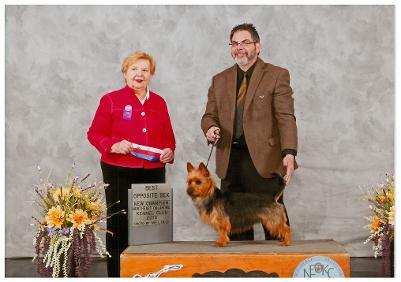 Grand Champion Dunham Lake Goody Two Shoes "Judy"
Terrier Group 3 win in Hutchinson under Judge David Kirkland. under Judge Mrs. Charlotte Patterson. More information and photo's here. Finished her Championship at 10 months of age. 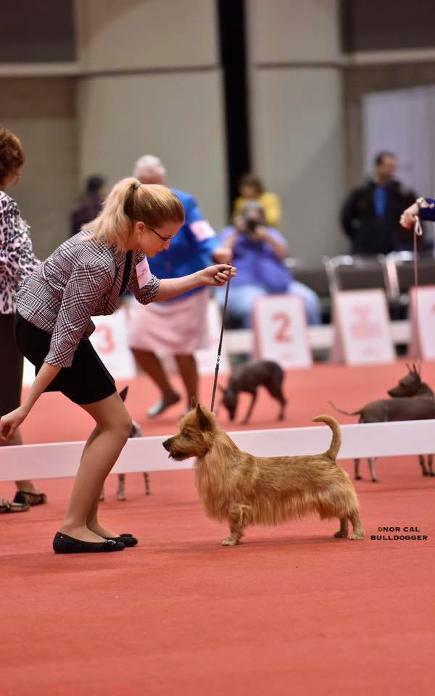 Judy's new forever family, the Van Buren family and their daughter Top Junior Handler Samantha Van Buren will be showing her. We are thrilled about this duo! Judy was originally hand picked as our show prospect for our wonderful friends in the United Kingdom, but due to some matters out of our control, she was not able to travel as a passenger to England. She is a gorgeous girl, with a great show personality as well. Look for updates on this team! Thank you to all the Judges that have evaluated this beautiful Aussie. 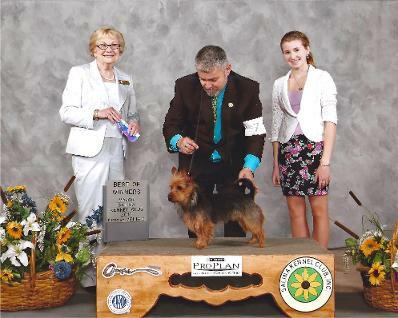 International and AKC Champion Dunham Lake Moon Dream "Miles"
Select win and Best Bred By at the 2014 AKC Eukanuba Championship! Miles really is the "come back kid". In August 2011, Miles was in a serious car accident, which broke his front elbow, thankfully, after two surgeries, he is recovering nicely. Thank you to his family for such excellent care! 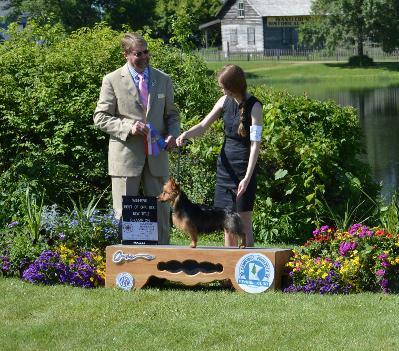 Winning at dog shows, Best Puppy wins, we're very proud of this guy. He is co-owned with the Bustamante family and lives in Florida. Ch. 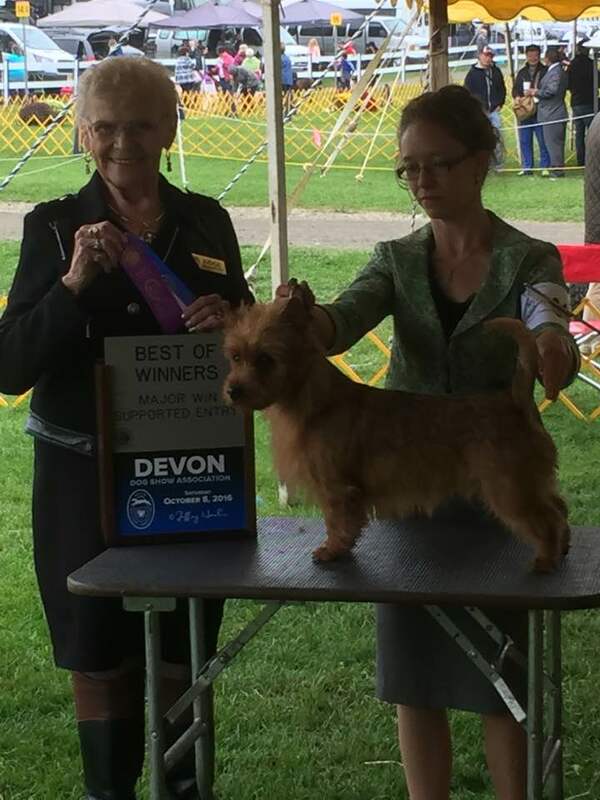 Dunham Lake Celebration "Mara"
and finished her Championship with Ellie Goiffon in the Bred By Class. 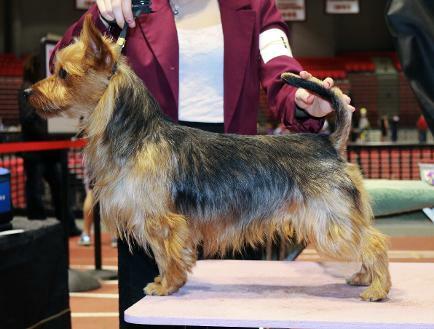 Int'l and AKC Champion Dunham Lake You might be Surprised "Emma"
Owned by Michael and Sandra Fredrick in Minnesota. 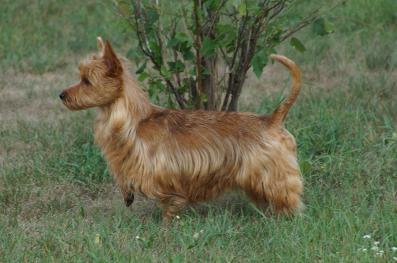 Dunham Lake The Show "Malbec"
The gorgeous boy is owned by Luisa in Florida and will b shown and co-owned by us. Look for updates! CH Dunham Lake Roaming the Rockies "Riikka"
This special girl is owned by Katrina in Colorado and will be a show prospect, co-owned by us. Look for updates! UKC CH Dunham Lake Byron Bay "Byron"
Dunham Lake Golden Ticket Darwin won his AKC Championship at the Montgomery County Kennel Club in 2016 at 11 months of age. Dunham Lake Most Valuable Player "Posey" will be living with her family in California. Dunham Lake Arista's Magic Cheers to You! 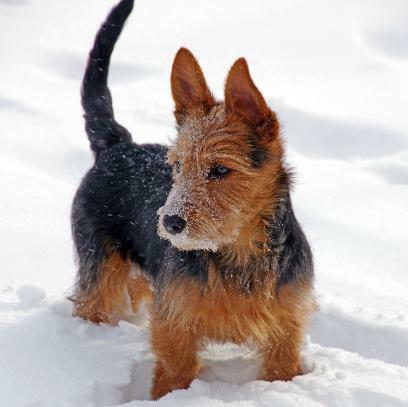 Owned by Debb Miller who has been a long time owner, handler and breeder of Australian Terriers. We are honored to Karla be shown by Debb and enjoy life with her family out east. Look for updates and show news. 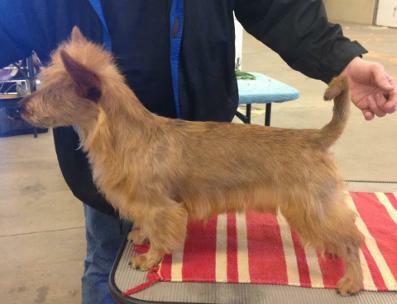 Ch Dunham Lake Frankley my Dear I don't Give a Damnn "Scarlet"
Wins her first point 03-01-14 at her very first show. Owned by Chris Chapman, in Oklahoma is showing this beautiful girl. 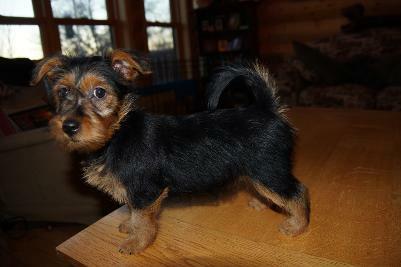 International and National Puppy Champion Dunham Lake Right on Target "Archer" at only 4 months old. Best of Winners and 2 Majors! Shown here by our friend Tim Smith. 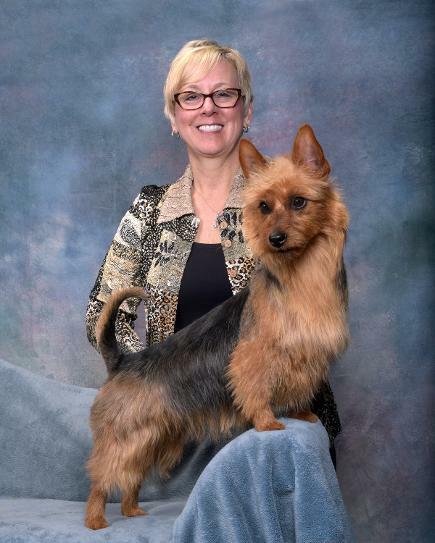 Usually shown by his owner/handler Monica Stross also new to the ring. So proud of both of them. Lucy is owned by Donna and Gerry and co-owned by us. She already has won a 4 point major at 10 months old. 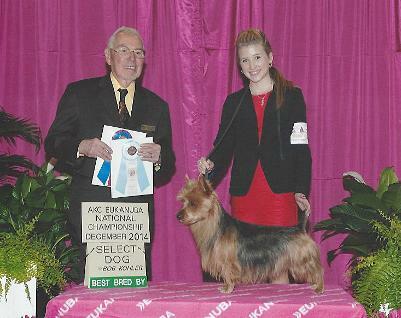 Co-owned with The Ensign Family, Donna was a former Handler of Shelties. Bea is their family dog and is doing well showing. Only a couple single points left to finish this girl.